I can write Complex Sentences with subordinate clauses (since, when, if, after, because, who, which, that). I can analyze my writing to determine if my purpose and audience have been fully addressed. I can support my title by using logical reasoning and relevant and sufficient evidence. I can demonstrate an understanding of how AG and JC develop as leaders over the course of a text. I can produce a clear and coherent poster with no errors. I can design a poster that is organized and in a style appropriate to the task. I can Use technology to produce and publish a poster. In a year long expedition the 7th grade learned about the foundations of Western Civilization through the eyes of major leaders. The expedition culminated with a leadership summit which featured a Socratic Discussion from leaders of our community and a student work gallery. 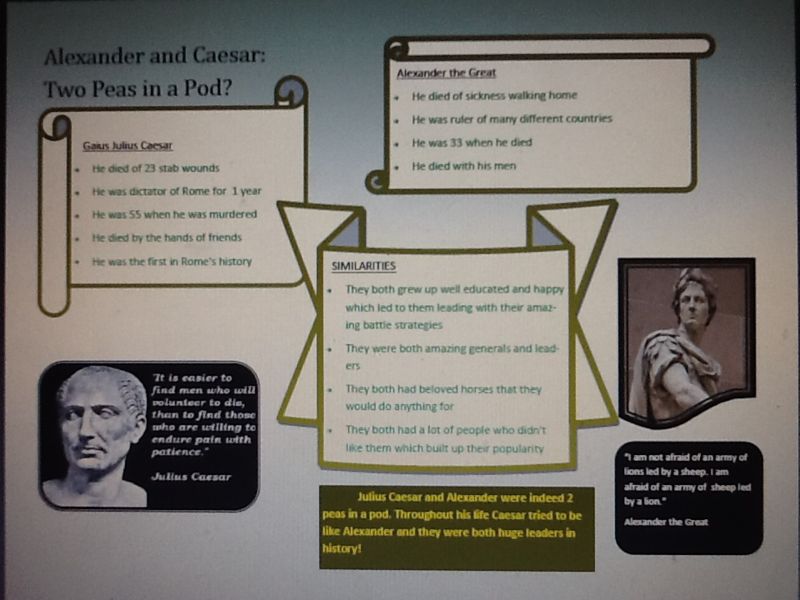 Within the gallery were posters comparing Alexander The Great to Julias Ceasar, Dream Houses created by Math students and a living History museum where students took on the role of an influential world leader past and present.